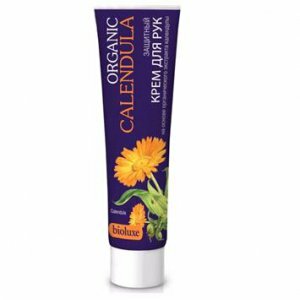 Organic Calendula Protective Hand Cream is produced by the Russian beauty brand Bioluxe. The product is formulated with organic calendula flower extract. It is designed to protect the skin of your hands from harmful environmental factors and improve skin elasticity. This cream is a real salvation for your hands! It makes the skin noticeably softer and smoother, moisturises and nourishes it. The cream contains calendula extract. Calendula (marigold) is widely used in medicine due to its anti-inflammatory, antiseptic and healing properties. Thanks to this ingredient, the product takes gentle yet effective care of your hands, softens the skin, protects it and accelerates the healing of minor skin injuries. Ingredients. Aqua, Cetearyl Alcohol, Stearic Acid, Isopropyl Palmitate, Helianthus Annuus Seed Oil, Elaeis Guineensis Kernel Oil, Calendula Officinalis Extract, Glycerin, Potassium Hydroxide, Parfum, Benzyl Alcohol, Benzoic Acid, Sorbic Acid. Want to buy Organic Calendula Protective Hand Cream? Call us or submit your order via our web site!